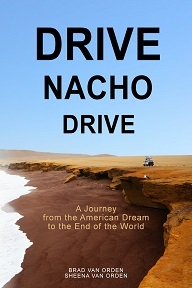 Drive Nacho Drive, Brad and Sheena’s first book, tells the story of their drive from Arizona to the tip of South America. It is a tale about stepping away from the American Dream to drive as far south as it is possible to drive in the world. 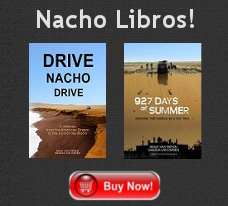 927 Days of Summer picks up the story where Drive Nacho Drive left off. 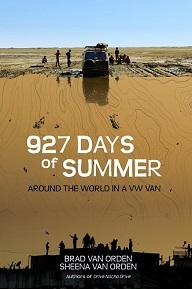 It is a documentary of patience, nerve, and adventure along the highways and backroads from Asia’s east coast to America’s west coast – a circumnavigation of the globe – seen through the windshield of an aging VW van. In their book Drive Nacho Drive, Brad and Sheena Van Orden traded the American Dream for the open road, and set off in their temperamental 1984 VW van named “Nacho.” After thirteen months of humorous and sometimes demoralizing misadventures along the Pan-American Highway, our intrepid subjects eventually arrived at the southernmost town in the world in Tierra del Fuego. This is where 927 Days of Summer picks up the trail. 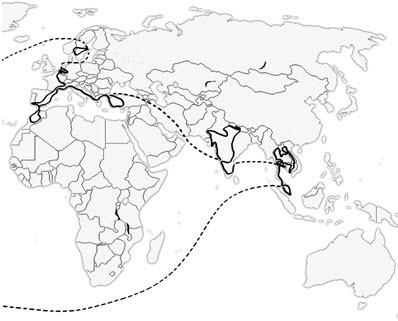 After shipping Nacho from Argentina to Malaysia on a container ship, Brad and Sheena resume their journey, this time with the ambitious goal of driving all the way around the world. When they roll out of the shipping container onto Malaysian soil, their odometer turns over 300,000 miles. Is Nacho really up for the brutal journey ahead? This hilarious and harrowing tale cuts through the sweltering jungles of Southeast Asia to the buzzing hornet’s nest of India, from the remote Nepalese Himalayas to the stony hills of Anatolia, on to the Sahara Desert of Africa, through Europe and beyond. Whether dodging rickshaws on crater-filled roads, defying Maoist rebels on cliff-hanging Himalayan tracks, getting hopelessly stuck in the desert on the Pakistani border, or becoming the subjects of an international missing persons case in the remote mountains of Laos, there is never a dull moment in 927 Days of Summer. Come along as a diverse cast of characters guides our determined travelers through a world of unfolding landscapes and cultures on the road trip to end all road trips, and then ask yourself: can you really just go home, unpack, and eat a sandwich?